You’re old school, right? Now, we don’t mean just like 90s or 80s old school, we’re talking like reeeally old school. Back when kings and queens ruled over the lands before technology had tainted the world and science seduced us all. If you want to give your friends a blast to the past and show everyone what true elegance looks like then we’ve got the perfect costume for you this Halloween. Feast your eyes on this lovely Adult Elizabethan Costume! Relive those wondrous years once you slip into this maroon and gold dress. Walk around town in this old fashion ensemble and make people question what century they woke up in that morning. You’ll look as if you are still under the rule of Queen Elizabeth. You can have tons of fun randomly shouting out, “Long live the Queen” in this costume while walking down the street, tearing it up on the dance floor, or even while you enjoy a cup of tea. The Elizabethan period had a unique and sophisticated sort of style that is missing in today’s fashion, but this costume captures all of that beauty and grace that has been lost throughout the centuries. Top off the lovely ensemble with the included gold braided headpiece. You’ll look just a classy and stylish as royalty but you’ll be better! You won’t have to deal with all the stress of politics a queen must endure day in and day out. 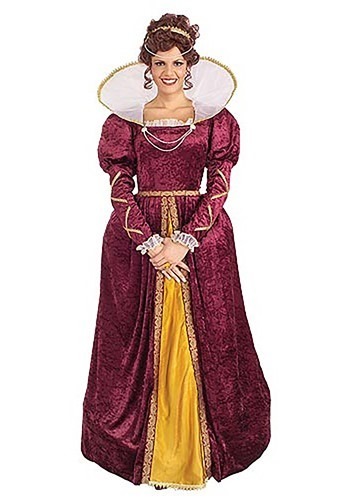 Go reeeally old school this year and grab this Elizabethan Costume. Remind everybody in the party scene what it truly means to be beautiful and elegant!